An optical fiber for the telecommunication is made of glass designed to guide light along its length by total internal reflection. 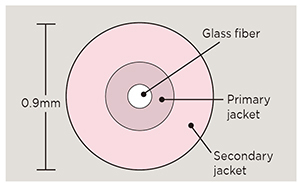 The glass fiber has nominal diameter of 125µm (0.125mm) and covered with plastic jacket for protection to form 250µm or 900µm in diameter. 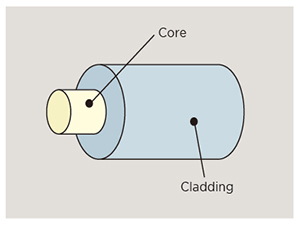 The central part of the glass fiber which guides light is called “core” and the “cladding” around it has lower refractive index than the “core” to confine the guided light. Silica glass is fragile; therefore, it is covered with a protective jacket. There are three typical coatings for the optical fiber. This is covered with a UV cured-Acrylate to a diameter of nominal 0.25mm. Since it has an extraordinary small diameter, it has a superior capacity to fit a large number of fibers into a cable and is used widely. Or tight or semi-tight buffered fiber. This is optical fiber covered with thermoplastic to a diameter of 0.9mm. Compared to 0.25mm fiber, it is stronger, easier to handle and is widely used in LAN wiring and other small fiber-count cable. 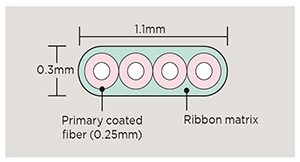 Ribbon fiber provides an excellent way to boost the productivity of connector assemblies and facilitates mass fusion splicing for greater productivity. The ribbon is composed of 4,8 or 12 colored fibers for fiber counts as great as 1000. The fibers are encapsulated by a UV-acrylate material which can be easily removed with standard strippers for mass splicing or easily peeled apart for single fiber access. Ribbon can be spliced at once with mass –fusion splicer and easy for identification in high fiber-count cable. Here’s the most common description of the varieties of telecommunication fibers. Technically you can use any fibers for FTTx as far as the optical budget allows, but the most common application for FTTx shall be by G.652 and G.657. Multi mode fiber (MMF) is used for communication over short distance, such as LAN and datacenter. MMF classified M1 to M4 according to ISO/IEC. Each bandwidth and distance is defined as follows. ITU-T G.651 is another name for OM2/OM3 or MMF(50/125). ITUT recommendation does not have OM1 or MMF(62.5/125) which is still popular in US. The core of MMF(50/125) has a refractive index profile gradually changing from the center of the core to the cladding, which enables multiple of transmission light (mode) travel with nearly the same velocity. It is the most common SMF in the world. It is tuned to minimize the dispersion (which gives the deformation to the signal) around the wavelength at 1310nm. You can use 1550 nm wavelength window for the shorter distance or with the dispersion compensating fiber or module. G.652A/B is the basic SMF and G.652C/D is the category for Lowwater-peak SMF. It is designed to minimize the dispersion at around 1550nm where the optical loss is the smallest. Official name for G.654 is “cut-off shifted fiber”, but it is better known as low attenuation fiber. Sumitomo’s Z Fiber™ has the world record of 0.154 dB/km. Thanks to this low attenuation the major application for G.654 is in the submarine and terrestrial long-haul application such as 400km reach without repeater. 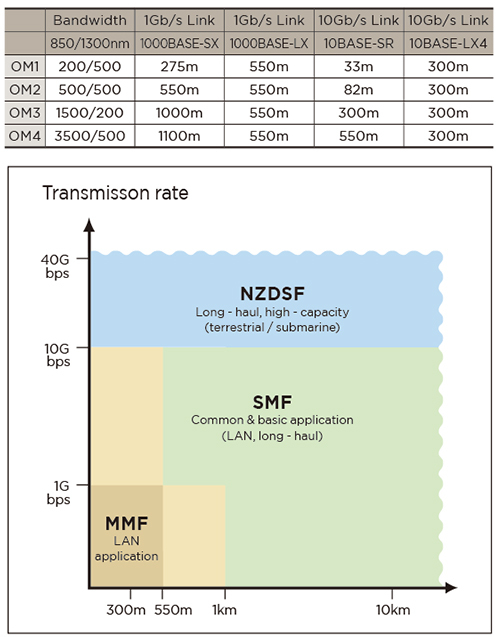 NZDSF is short for NZDSF for wide band transport fiber. G.653 has designed to have zero dispersion at 1550nm, but G.655 has positive or negative dispersion intently. The reason for that is to reduce the undesirable effect of the non-linear phenomenon which interfere with the adjacent wavelength in DWDM system. The first generation NZDSF such as PureMetro™ has smaller dispersion of around or less than 5ps/nm/km to make the dispersion compensation easier. On the other hand the second generation NZDSF such as PureGuide™ has larger dispersion of around 10ps/nm/km to enhance the DWDM capacity to double. It is a kind of NZDSF which has stricter requirements on the dsipersion slope which enables to guarantee the DWDM performance in wider wavelength range. This category is introduced to specify macrobending performance, which sports implementation in FTTH and access network. G.657.A is fully compliant with ITU.T-G.652 specification, on the other hand, G.657.B is required higher macrebending performance but not necessary to comply with G.652.